In the past few months, there were strong warning signs that some of the biggest apps would be moving their payments outside Apple’s (AAPL) App Store. Netflix (NASDAQ:NFLX) had started experimenting with the alternative payment option in smaller markets in September. Netflix finally pulled the plug on in-app payments at the end of 2018. Although this was a question of when and not if, the speed with which Netflix was able to shift to a new payment option should be a challenge for Apple. Apple’s management has mentioned that the largest app contributes less than 0.3% of the total services revenue. However, customers will also become more comfortable in paying outside the App Store as other large apps shift to outside payment options. App Store makes up a big slice of Services revenue and contributes the majority of the profits due to its high gross margin. Analysts like Bernstein’s Toni Sacconaghi have mentioned this headwind for the stock. A big dent in App Store revenue would be a significant bearish factor for Apple’s stock. Investors should closely follow the scale of this headwind and the possible solutions offered by the management. I published an article on 8th September in which some of the new hurdles in App Store were mentioned. At that time, Netflix was testing with its independent payment option outside the App Store. It was clear that Netflix would sooner or later end up shifting all the customers to the independent payment system. However, what is surprising is the speed at which this alternative was launched globally to all users. Within less than 4 months from the start of the testing, Netflix was able to move all the subscribers to an independent payment option. This shows two big trends. First, brands with higher customer loyalty and a decent scale can take the risk to build their own independent payment system within a short time. Secondly, customers in all the regions are at least okay with the extra steps required in making payments outside the App Store. Spotify (SPOT) has already used this approach. It is likely that many of the other major apps would follow suit in the next few quarters. Another big change which has been gathering pace is the popularity of Tencent’s (OTCPK:TCEHY) mini-programs in China. In the last earnings call, Tencent mentioned that it has 1 million mini « apps » which live outside the ecosystem of a usual app store. Tencent’s WeChat has over 1 billion users in China, which gives the company the required scale to promote new mini-programs within its own ecosystem. This essentially reduces the importance of Apple’s App Store as more developers focus on these mini-programs to get instant customer traction. The net effect is that Apple loses out on the commissions. The trailing-twelve-month revenue of Services segment is $38.5 billion. Last year, Apple announced that App Store made $26.5 billion for developers in 2017. With a growth rate of close to 25%, the earnings for developers in 2018 would be in $30 billion to $35 billion range. This would put App Store revenue share for Apple at around $10 billion. We can see that App Store already makes a decent chunk of the total Services revenue. However, the bigger impact of App Store will be on the bottom line. App Store is a very high gross margin business compared to other businesses in Services segment like Apple Music. A WSJ report mentioned that Apple Music’s gross margin could be close to 15%, while App Store’s gross margin would be over 90%. We can also consider Apple’s Music and online content business to be « empty calories » for the short term. It is unlikely they will contribute positively to the bottom line in the near term, although they can certainly expand Apple’s ecosystem. While Apple would have got easy commissions from music and video streaming apps in the past, it will now have to invest heavily in building its own platforms. We should eventually see a lower commission rate from Apple as the company tries to prevent other big earners from building their own payments system. A research note by Ben Schachter from Macquarie Research mentions that App Store is currently on track to earn $20 billion by 2020. However, if the commission rate were reduced to 15%, the revenue projection would fall to $11.5 billion. In an extreme case where the App Store commission falls to 5%, the income estimates fall to a mere $3.7 billion. It is unlikely that App Store’s commission will fall to a low single digit. However, the flight of major apps and a possible lower commission rate can be a double whammy for this business. This will not only hurt Services growth rate but will also hurt the overall EBIT for the company. Given the speed of the changes we saw in 2018, it is likely that the management will come out with some major statement regarding this segment in the near future. There is also the Supreme Court case of Apple v. Pepper. This case is arguing that customers have the right to sue anyone who delivers the goods to them, even if the overall prices are set by third-party sellers. There is a very high probability that Apple would be forced to modify its commission rate through regulatory or competitive pressures. In the latest earnings call, Apple mentioned that the Services gross margin was 62% compared to 58% in the year-ago period. 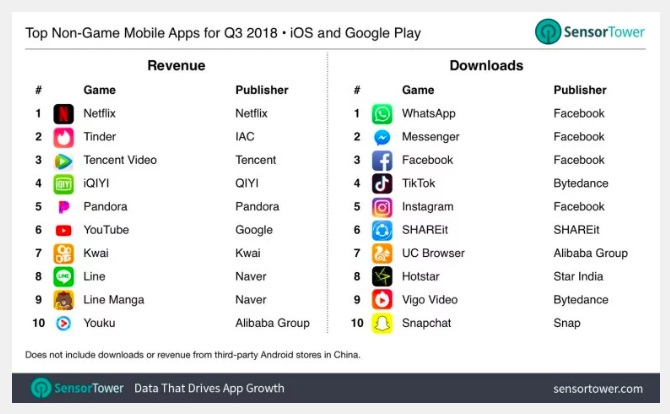 This could be the peak level of margin for Services in the near term as Netflix and other big contributors to the App Store leave the platform. We already know about major challenges due to lower iPhone sales and a delay in 5G launch. If the App Store shows a major decline in future prospects, we should expect a big correction on Apple’s stock. Apple’s App Store faces new challenges as Netflix moves its payments outside the app. Other big streaming companies could also follow Netflix in the next few months. On the other hand, Apple’s own streaming music and content platform will not be able to show the margins which were provided by other streaming apps on App Store. Falling revenue or lower commission rate can be a major headwind for Apple’s Services segment. Challenges faced by iPhone segment will further increase the bearish argument against Apple.